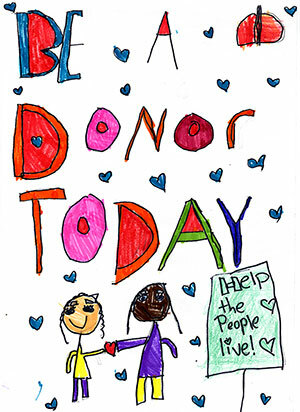 The Organ/Tissue Donor Program held its Statewide Organ/Tissue Donor Student Poster Contest in 2018. A letter from the Secretary and entry form for the contest was mailed out to all K-12 grade public and non-public schools statewide in October. Winners were selected from each category (K-2, 3-5, 6-8 and 9-12) and an overall grand prize winner. The winners are invited to Secretary White's office at the Capitol Bldg in Springfield, IL for a ceremony unveiling the new poster in April. Winners will receive award certificates that will be presented to them at the Poster Contest Ceremony from the Secretary. In addition to the awards, the winners will be presented gift cards to Barnes and Noble Bookstore. The overall winner will receive a $100 gift card and the others will receive a $50 gift card, compliments of Donate Life Illinois. For more information on the Organ/Tissue Donor Student Poster Contest please contact Samantha Brill at 217-558-1322 or via email at Sbrill@ilsos.net. Elizabeth M., Gallatin County High School, Junction, 9-12 grade winner, 18 years old.